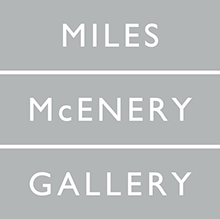 NEW YORK – MILES MCENERY GALLERY is pleased to present an exhibition of works by John Sonsini, on view 18 April through 24 May at 520 West 21st Street. A public reception will be held for the artist on Thursday 18 April from 6:00 to 8:00 p.m. The exhibition is accompanied by a fully illustrated publication featuring an essay by Marie Heilich. Invigorated by expressive brush strokes and larger than life scale, John Sonsini’s paintings of “Los Angelenos”—Los Angeles Latinos—present a visceral take on portraiture. Widely known for his portraits of “Day Workers,” the paintings in this current exhibition depict various sitters from the artist’s Pico Union/Koreatown neighborhood near to downtown Los Angeles. Sonsini is less interested in an observational realism and more engaged with capturing a sensation of the sitter’s presence through his unique handling of oil paint. In the artist’s own words “I paint men who I think are remarkable people, and I try to make the paint behave in a way that will convey that”. In Sonsini’s works, the sitters—usually single gures or small groups—are painted in the artist’s Los Angeles studio in daily sessions until each painting is complete. Illuminated by solid, colored backgrounds, the subject of the portrait is often accompanied by objects from daily life such as caps, suitcases, wallets, or soccer balls. The inclusion of these items in Sonsini’s portraits are there to suggest, rather than to explicitly reveal, a sitter’s narrative. A similar form of inquiry is posed by Sonsini’s still life works. In the absence of living figures, his evocatively painted objects—often items left behind by sitters—possess the curious ability to evoke their own narratives and create an intensely intriguing sense of presence through absence. JOHN SONSINI was born in 1950 in Rome, NY. 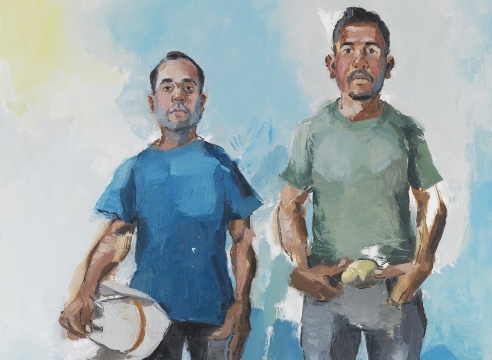 Recent solo exhibitions include “A Day’s Labor: Portraits by John Sonsini,” Art Design & Architecture Museum, University of California, Santa Barbara, CA; “Daywork: Portraits,” Long Beach Museum of Art, Long Beach, CA; Ameringer | McEnery | Yohe, New York, NY; “John Sonsini,” Patrick Painter Gallery, Los Angeles, CA; “John Sonsini: New Paintings,” Bentley Gallery, Phoenix, AZ; “John Sonsini: Paintings,” Kucera Gallery, Seattle, WA; “John Sonsini: New Paintings,” Inman Gallery, Houston, TX. Recent group exhibitions include “Collecting on the Edge,” Nora Eccles Harrison Museum of Art, Utah State University, Logan, UT; “Belief in Giants,” Miles McEnery Gallery, New York, NY; “Modern and Contemporary,” Cantor Arts Center, Stanford University, Stanford, C A; “ The Sweat of Their Face: Portraying American Workers, ” National Portrait Gallery, Washington, D.C. ; “¡Cuidado! - The Help,” Greg Kucera Gallery, Seattle, WA; “Human Interest: Portraits from the Whitney’s Collection,” Whitney Museum of American Art, New York, NY. His work may be found in the public collections of the AD&A Museum University of California, Santa Barbara, CA; the Addison Gallery of American Art, Autry Museum of the American West, Los Angeles, CA; Philips Academy, Andover, MA; Birmingham Museum of Art, Birmingham, AL; Bronx Musuem of the Arts, New York, NY; Cornell University, Permanent Collection, Ithaca, NY; The Broad Art Foundation, Santa Monica, CA; The Frances Young Tang Museum, Skidmore College, Saratoga Springs, NY; Hammer Museum, University of California, Los Angeles, Los Angeles, CA; Henry Art Gallery, University of Washington, Seattle, WA; High Museum of Art, Atlanta, GA; Los Angeles County Museum of Art, Los Angeles, CA; Museum of Contemporary Art, Los Angeles, CA; Museum of Contemporary Art, San Diego, CA; Nerman Museum of Contemporary Art, Johnson County Community College, Overland Park, KS; Nora Eccles Harrison Museum of Art, Utah State University, Logan, UT; Portland Art Museum, Portland, OR; San Francisco Museum of Modern Art , San Francisco, C A; Santa Barbara Museum of Art , Santa Barbara, C A; The Smithsonian American Art Museum, Washington, D.C.; The Solomon R. Guggenheim Museum, New York, NY; The Weatherspoon Museum, University of North Carolina at Greensboro, Greensboro, NC; and The Whitney Museum of American Art, New York, NY. John Sonsini lives and works in Los Angeles, CA and Queretaro, Mexico.